"Hammer Time" and "Can't Touch This" redirect here. For the reality TV show, see Hammertime. For the game show, see Can't Touch This (game show). "They Put Me in the Mix"
(1989) "U Can't Touch This"
(1990) "Have You Seen Her"
"U Can't Touch This" is a song co-written, produced and performed by MC Hammer from his 1990 album Please Hammer, Don't Hurt 'Em. The track is considered to be Hammer's signature song and is his most successful single. Along with Hammer, Rick James shares songwriting credits with Alonzo Miller because the song samples the prominent opening riff of "Super Freak". The song has been used or referenced in multiple television shows, films, commercials and other forms of media. It has also received numerous awards and recognitions. The song is notable as the winner of the Best R&B Song and a Best Rap Solo Performance and the first rap song to be nominated for Record of the Year at the 33rd Annual Grammy Awards in 1991 as well as the Best Rap Video and Best Dance Video at the 1990 MTV Video Music Awards. It peaked at No. 1 in the Billboard Hot R&B/Hip-Hop Singles & Tracks and on the charts in several countries. The song samples the prominent opening riff of the Rick James song "Super Freak", which is repeated throughout the recording. The lyrics describe Hammer as having "toured around the world, from London to the Bay" and as being "magic on the mic", which Hammer says coincides with James' "beat that you can't touch". Additionally, the song lyrics "You can't touch this" and "Stop! Hammer time!" became pop culture catchphrases. Hammertime was later used as the title of a reality show starring Hammer on the A&E Network in the summer of 2009. The sample of "Super Freak" that forms the basis of the song led Rick James and other performers on the original record to file a lawsuit for infringement of copyright. The suit was settled out of court when Hammer agreed to credit James as a songwriter, effectively granting James millions of dollars in royalties. The song was first performed publicly on a late 1989 episode of The Arsenio Hall Show. Because the song was not initially released as a single, listeners had to purchase the album, which as a result, went on to sell more than 18 million copies, gaining multi-platinum certifications from the RIAA, as well as in other countries. Directed by Rupert Wainwright, a music video was produced to promote the single, showing Hammer doing some of his signature dances, such as "The Running Man" and the "Hammer Dance". In April 1990 "U Can't Touch This" hit the Top 40. The song also secured a Best R&B Song and a Best Rap Solo Performance in 1991, a new category at the time and the first rap song to be nominated for Record of the Year. The single was a major success, reaching #1 on the Billboard Hot R&B/Hip-Hop Singles & Tracks and no. 8 on the Billboard Hot 100. The track also performed successfully in other parts of the world, peaking at no. 1 in Australia, Netherlands, New Zealand and Sweden, and no. 3 on the UK Singles Chart. In September 1990, the video for "U Can't Touch This" won an MTV Video Music Award for Best Rap Video and Best Dance Video and was nominated for Best Male Video, Best Editing, and Best Choreography. In 1991, Kids Incorporated covered "U Can't Touch This" in the Season 7 episode "Pipe Dreams". In 1999, MTV's 100 Greatest Videos Ever Made included "U Can't Touch This" at No. 71. In October 2000, VH1's "100 Greatest Dance Songs" included "U Can't Touch This" at No. 88. In May 2001, VH1's 100 Greatest Videos included "U Can't Touch This" at No. 59. In August 2005, "U Can't Touch This" was certified gold. In December 2007, VH1's 100 Greatest Songs of the 90s included the song at No. 16. During 2008, the song ranked as No. 26 on VH1's 100 Greatest Songs of Hip Hop. The song is used comically in various films of the 2000s and 2010s such as Bubble Boy, Charlie's Angels: Full Throttle, Kung Pow! Enter the Fist, Shark Tale, White Chicks, Racing Stripes, Transformers: Age of Extinction and Transformers: The Last Knight, among others. In 1991, a parody entitled "I Can't Watch This" was released by "Weird Al" Yankovic for his album Off the Deep End, with lyrics complaining about bad TV shows overlaid on the song's music track and featuring samples of various commercials during the breakdowns. A groove metal cover of the song was performed by the Austrian NDH band Stahlhammer, infused with death growls and heavy guitar riffs. Before the 1990 NFL season started, the Miami Dolphins parodied the song as "U Can't Touch Us". Peter Griffin parodies this song as "Can't Touch Me" in the Family Guy episode, "E. Peterbus Unum", giving examples of flaunting his diplomatic immunity, including telling MC Hammer that he cannot sue for plagiarism and walking on the grass. Grup Vitamin, Turkish parody group, parodies this song as "Dokundur" in "Bol Vitamin" album in 1990 and as "Sürtündürt" in "Grup Vitamin" one in 1991. The TV sitcom Mrs. Brown's Boys performed "U Can't Touch This" as a dance routine at the end of the 2015 Christmas episode. It is also played by Agnes Brown's Christmas tree, that punches anyone who gets too close; the tree says the opening "U Can't Touch This! ", then boxing gloves extend, punching the would-be thief. The Annoying Orange parodies the song as "Can't Squash This". The theme song for the British children comedy talk TV show Hacker Time is a parody of the song, but the lyrics ended with "Sorted Hacker Time". The YouTube channel "How It Should Have Ended" created a parody, titled "Not Worthy", featuring various clips of Thor within the Marvel Cinematic Universe. ^ a b Pastorek, Whitney (January 11, 2010). "20 Years Ago: MC Hammer drops 'U Can't Touch This'". Entertainment Weekly. Retrieved February 6, 2017. ^ Pemberton, Pat (June 14, 2012). "U Can't Touch This". Rolling Stone. Retrieved February 26, 2017. ^ Magill, Frank N. (1998). Chronology of Twentieth-century History: Arts and Culture. Fitzroy Dearborn. p. 1822. ISBN 978-1-88496-466-4. ^ "Hammertime – A&E TV". Archived from the original on May 14, 2009. . Hammertime. ^ "MC Hammer". Answers.com. Retrieved October 22, 2010. ^ Rant, Screen (March 4, 2006). "MC Hammer – U Can't Touch This(Live @ Arsenio Hall)". Metacafe. Retrieved June 17, 2014. ^ Huey, Steve. "MC Hammer – Please Hammer, Don't Hurt 'Em". AllMusic. All Media Network. Retrieved June 30, 2014. ^ "MC Hammer - U Can't Touch This". EMI Music. YouTube. Retrieved June 17, 2014. ^ a b c d e f "Please Hammer, Don't Hurt 'Em – Awards". AllMusic. Retrieved June 17, 2014. ^ a b "Official Singles Chart Top 100". Official Charts Company. Retrieved June 17, 2014. ^ Ali, Rahsheeda. "The 100 Greatest Songs Of the '90s". VH1. Retrieved June 17, 2014. ^ "Australian-charts.com – MC Hammer – U Can't Touch This". ARIA Top 50 Singles. Retrieved June 17, 2014. ^ "Austriancharts.at – MC Hammer – U Can't Touch This" (in German). Ö3 Austria Top 40. Retrieved June 17, 2014. ^ "Ultratop.be – MC Hammer – U Can't Touch This" (in Dutch). Ultratop 50. Retrieved June 17, 2014. ^ "Top RPM Dance/Urban: Issue 7958." RPM. Library and Archives Canada. Retrieved May 12, 2015. ^ "Top RPM Singles: Issue 1272." RPM. Library and Archives Canada. Retrieved May 12, 2015. ^ "Top 3 Singles in Europe" (PDF). Music & Media. Vol. 7 no. 39. September 29, 1990. p. VII. Retrieved March 23, 2018. ^ "MusicSeek.info – UK, Eurochart, Billboard & Cashbox No.1 Hits". MusicSeek.info. Archived from the original on June 14, 2006. ^ "Lescharts.com – MC Hammer – U Can't Touch This" (in French). Les classement single. Retrieved June 17, 2014. ^ "Offiziellecharts.de – MC Hammer – U Can't Touch This". GfK Entertainment Charts. Retrieved October 16, 2018. ^ "The Irish Charts – Search Results – U Cant Touch This". Irish Singles Chart. Retrieved June 17, 2014. ^ "Nederlandse Top 40 – MC Hammer - U Can t Touch This" (in Dutch). Dutch Top 40. Retrieved June 17, 2014. 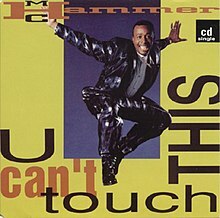 ^ "Dutchcharts.nl – MC Hammer – U Can't Touch This" (in Dutch). Single Top 100. Retrieved June 17, 2014. ^ "Charts.nz – MC Hammer – U Can't Touch This". Top 40 Singles. Retrieved June 17, 2014. ^ "Norwegiancharts.com – MC Hammer – U Can't Touch This". VG-lista. Retrieved June 17, 2014. ^ "Swedishcharts.com – MC Hammer – U Can't Touch This". Singles Top 100. Retrieved June 17, 2014. ^ "Swisscharts.com – MC Hammer – U Can't Touch This". Swiss Singles Chart. Retrieved June 17, 2014. ^ "CASH BOX Top 100 Pop Singles – Week ending JUNE 23, 1990". Cash Box. Archived from the original on October 7, 2012. ^ "ARIA Charts – End Of Year Charts – Top 50 Singles 1990". ARIA Charts. ARIA. Retrieved June 17, 2014. ^ "Jahreshitparade 1990" (in German). Austriancharts.at. Hung Medien. Retrieved June 17, 2014. ^ "Jaaroverzichten 1990" (in Dutch). Ultratop. Hung Medien. Retrieved June 17, 2014. ^ "Top 50 Dance Tracks of 1990". RPM. Vol. 53 no. 6. Library and Archives Canada. December 22, 1990. Retrieved July 18, 2018. ^ "Top 100 Hit Tracks of 1990". RPM. Vol. 53 no. 6. Library and Archives Canada. December 22, 1990. Retrieved July 18, 2018. ^ "Top 100-Jaaroverzicht van 1990" (in Dutch). Dutch Top 40. Retrieved June 17, 2014. ^ "Jaaroverzichten – Single 1990" (in Dutch). Single Top 100. Hung Medien. Retrieved June 17, 2014. ^ "Schweizer Jahreshitparade 1990" (in German). Hitparade.ch. Hung Medien. Retrieved June 17, 2014. ^ "Top 100 Hits for 1990". The Longbored Surfer. Retrieved January 3, 2018. ^ "The CASH BOX Year-End Charts: 1990". Archived from the original on October 7, 2012. . Cash Box magazine. ^ "Australian Fun Countdowns – Accreditation Awards". Australian Fun Countdowns. April 7, 2011. Archived from the original on December 12, 2013. Retrieved June 17, 2014. ^ "Canadian single certifications – MC Hammer – U Can't Touch This". Music Canada. ^ "Gold-/Platin-Datenbank (M.C. Hammer; 'U Can't Touch This')" (in German). Bundesverband Musikindustrie. ^ "Dutch single certifications – M.C. Hammer – U Can't Touch This" (in Dutch). Nederlandse Vereniging van Producenten en Importeurs van beeld- en geluidsdragers. Retrieved 11 April 2019. Enter U Can't Touch This in the "Artiest of titel" box. ^ "New Zealand single certifications – MC Hammer – U Can't Touch This/Dancin' Machine". Recorded Music NZ. ^ "British single certifications – MC Hammer – U Can't Touch This". British Phonographic Industry. Select singles in the Format field. Select Gold in the Certification field. Type U Can't Touch This in the "Search BPI Awards" field and then press Enter. ^ "American single certifications – M.C. Hammer – Can_t Touch This". Recording Industry Association of America. If necessary, click Advanced, then click Format, then select Single, then click SEARCH. ^ Seifert, Andy; Wolinsky, David (February 5, 2010). ""Let's Ram It!" and 25 years of other immortal NFL songs". Archived from the original on February 7, 2010. . The A.V. Club.